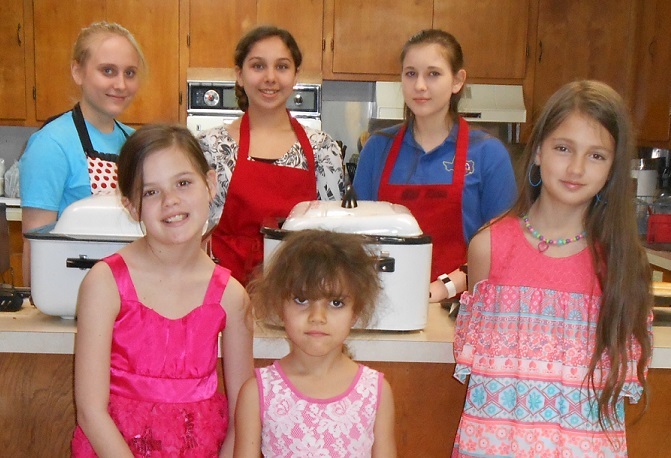 The Gun Barrel City Rainbow Girls held a Pancake Breakfast Fundraiser at the Cedar Creek Lake Masonic Lodge in Gun Barrel City on Saturday, March 17. They wish to thank everyone for their support as they raise funds to attend their annual conference Grand Assembly in June. Rainbow Girls participate in a wide array of activities, including leadership training, service projects, competitions, and annual retreats. Along the way, they gather invaluable life skills that help them become the best daughter, sister, student, and friend they can be. Contact Mrs. Tonya Currey at 903-920-5608 or Mrs. Donna Dean at 903-879-4305 or visit www.txiorg.org for information on joining the greatest organization for girls ages 11 through 20. Their younger group, the Pledges, have activities for girls ages 7 to 10. 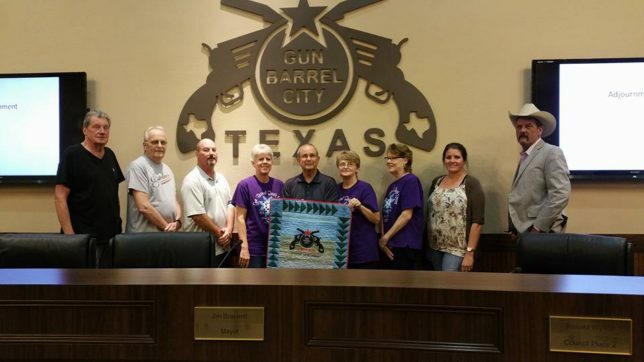 Gun Barrel City Rainbow Girls and Pledges are proudly sponsored by the Cedar Creek Lake Masonic Lodge and the Gun Barrel City Chapter of Eastern Star in Gun Barrel City. 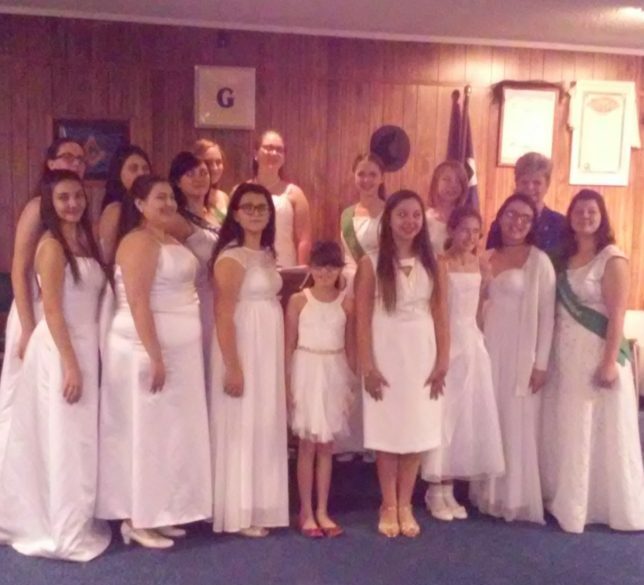 The Gun Barrel City Masonic Youth Rainbow Girls inducted two new members into their Assembly on Saturday, December 2. The new members are Katelyn Maxwell and Olivia Ocanas. Parents and grandparents were in attendance at the induction ceremonies. Friends of the late Mabelle Lane have found a heart — and toe — warming way to honor her memory. 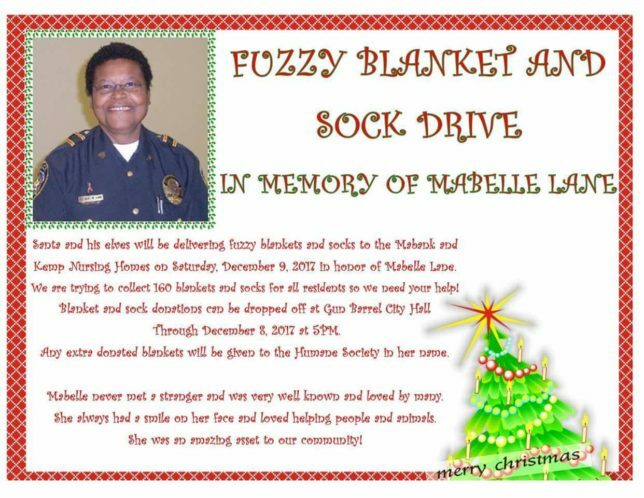 They are collecting fuzzy blankets and socks to deliver to nursing homes in Mabank and Kemp this Christmas. Lane passed away last month. She worked for Gun Barrel City from 1985-2012 and was the Chief of Police from 2004-2009. She was known to have a big heart and was loved throughout the community. Longtime GBC employee Mickie Raney explained the idea to donate blankets and socks came from a visit to see Lane a short time ago. The GBC Fire Department is very active in the community and in its efforts to protect the city’s residents. It has maintained an Emergency Operations Center (EOC) to coordinate communications around the area. 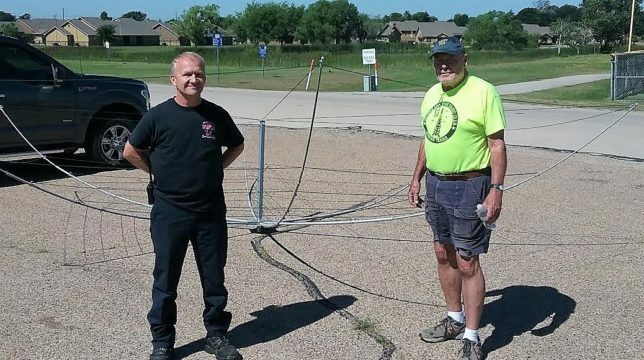 As we tragically saw with the recent tornadoes, entire areas can be wiped out and all electrical service, cell phone, internet and landline phones are useless.